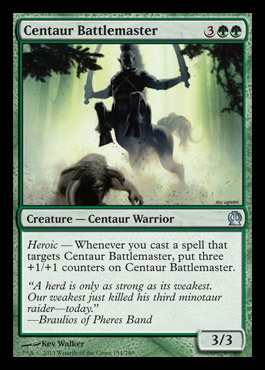 First up, the Centaur. Unfortunately overcosted, this guy will be a powerhouse in limited - and his ability would be super awesome even in constructed (if he were a colorless mana or two cheaper). As far as the Hydra, on the other hand, this guy is pushed. He unfortunately doesn't work as well with devotion as Kalonian Hydra, but his long list ot abilites are pretty strong - especially the haste. 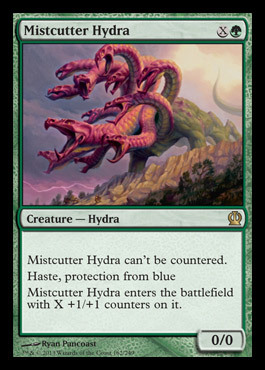 This Hydra will definitely see some constructed (standard) play.